Until recently, sandbags were typically used to build flood-control barriers. 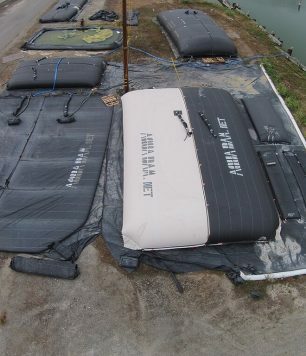 These sandbag flood barriers have a very low success rate, and many sandbags must be placed to make a barrier that conforms to USACE standards. Filling and transporting sandbags is expensive and time-consuming, and you’ll have to pay to dump the tons of sand and woven bags — which is now classified as hazardous waste — after the flood is over. The entire process is messy, tedious, and largely ineffective. Today, individuals, businesses, and governments all over the world are realizing the benefits of water-filled flood barriers as alternatives to sandbags. The AquaDam works by constraining (2) water-tight tubes within a woven outer sleeve. 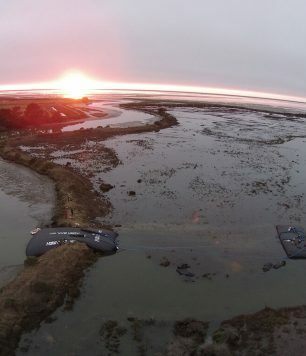 In conjunction with the stability baffle, this design creates a temporary non-rolling water-filled barrier which is able to control up to ¾ of its height in external mud/water depths, when filled with water. AquaDams provide a quick and effective way to create a temporary water-filled perimeter flood barrier. 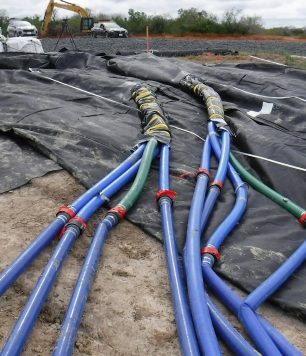 They don’t require heavy sandbags or large amounts of earth, which means labor and time spent installing this solution are minimal. Most of the installation time is spent waiting for the pumps to move water into the AquaDams. By using the onsite water to fill the flood barrier, there is minimal impact to the installation site, and minimal cost to construct the barrier. If you are responsible for flood control, you know it can be an exhausting and expensive undertaking. 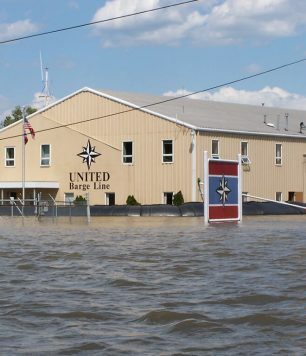 According to the U.S. Army Corps of Engineers, making a sandbag barrier capable of controlling 4ft of water depth would require 7,800 sandbags per linear foot. With an average total cost per sandbag of $3 to $6, that puts the price at $234 to $468 per linear foot of sandbag barrier, not including labor for installation and removal. 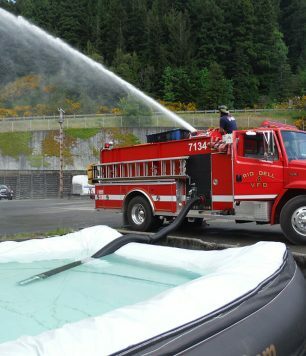 The price for a 5ft tall AquaDam, rated for up to 44” of water depth control, is less than half for the comparable sandbag alternative. After the AquaDam has been used, it can be drained, rolled, and stored, ready for the next deployment. 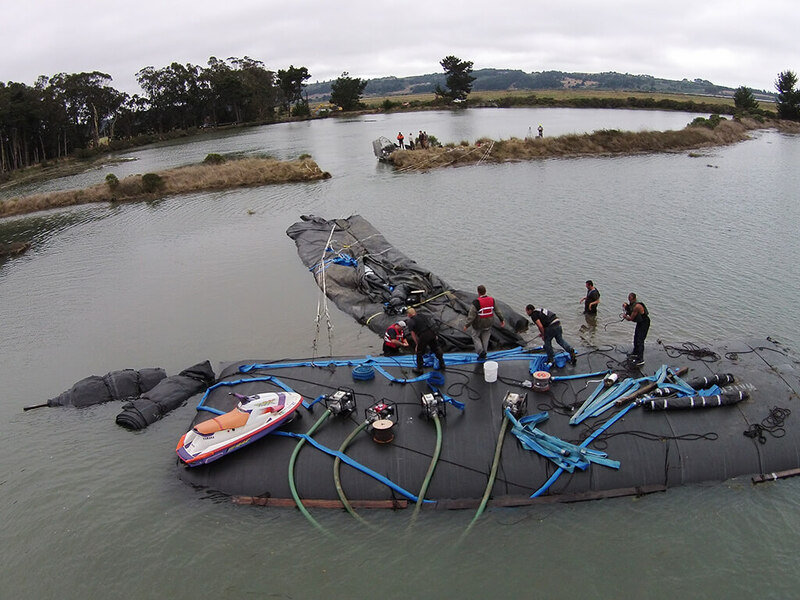 Care must be taken during removal to ensure the reusability of the AquaDam. Reusability is possible, but not guaranteed. Contact us today for more information about the capabilities provided by the AquaDam to flood mitigation responders. When the AquaDam reaches its design height, which is measured at the lowest point on its path, it’s considered full. Further filling will not result in additional control capacity or height, and the dam will be at risk of bursting. The typical AquaDam also does not allow for overtopping, and at ADI, we don’t supply water-filled barriers with an overtopping capability. If water levels seem as though they might exceed the controllable water depth of your primary AquaDam, you can use “fuse dams” — smaller solutions — to wash them out. The AquaDam should always be placed somewhere where it won’t be affected by any excavation activities in the work zone. In addition, if one is installed in a high-population area, it should be monitored 24/7 by a guard, as these barriers are vulnerable to cuts and other vandalism. Proper periodic maintenance pumping is sometimes required to maintain the height of an AquaDam. These units are often reusable under the correct circumstances, but the feature is not guaranteed. The AquaDam is a major part of a flood control plan, but there are other parts too. The deployment path of the AquaDam should be planned to be as flat as possible. Creating an AquaDam barrier through low spots will require larger AquaDams. While the AquaDam is an impermeable structure itself, there will be seepage through the ground beneath the AquaDam, into the protected area. Seepage control pumps should be placed at low points in order to remove seepage water as it accumulates. Failure to do so will result in flooding of the protected area. Fuel or electricity for these pumps must also be organized, so that a supply is available to the seepage control pumps as needed. A team of 4-6 people, with a 6000lbs telehandler forklift (and operator) is enough to deploy up to 6ft tall AquaDams. Pumps used for filling the AquaDam will determine how quickly the AquaDam will be installed. The more pumps running, the faster the AquaDam can be filled. Filling pumps should be supplied in pairs, to match the pair of inner tubes of an AquaDam. We are confident our AquaDams can help you with your flood protection needs, whether you are seeking to protect homes, neighborhoods, businesses, power plants or other structures in danger of flooding. These water-filled flood barriers have been proven to work when used appropriately along with other flood relief tools, and those who have used them agree that they are the best possible flood control devices when it comes to combining effectiveness, affordability and ease/rapidity of installation. For flood water depth control needs up to 38”, please contact AquaDam Flood Control Products, LLC. For flood water depth control needs greater than 38”, please contact Aqua Dam Inc.
To find out more information or for a free quote on AquaDams for your flood control projects, please contact us online or call us now at 1-800-682-9283.